Prime Minister: We are absolutely committed to restore order in the Ukrainian customs and count on your support. 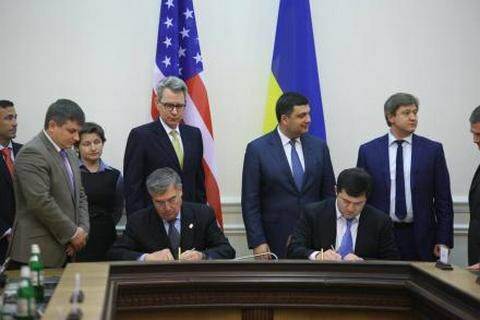 Ukraine and the United States signed on 23 May a mutual assistance agreement between their customs authorities. "At a meeting with Commissioner of U.S. Customs [and Border Protection Robert Gil Kerlikowske] today we will sign an agreement on interaction between the United States and Ukraine," Prime Minister Volodymyr Groysman said in a previously recorded video posted on the governmental website. "Over 25 years of our independence, our customs authority have not seen any structural changes, the whole system is riddled with corruption," said the premier. The agreement is aimed to improve cooperation between Ukraine and the United States in the customs field, the creation of a legal basis for the development of bilateral cooperation and mutual administrative assistance in customs sphere as well as "facilitating the adoption of measures to stop illegal actions that harm the economic interests of both countries. "We are absolutely committed to restore order in the Ukrainian Customs and look forward to your support and help," Prime Minister Volodymyr Groysman said at the signing ceremony. "Hopefully, we can conduct technical modernization of customs together – we need a lot of new equipment to prevent contraband and violations, to upgrade our software and, eventually, to refresh our human resources potential," Groysman went on to say. He also said that the government would adopt normative acts "aimed at resolving customs problems; we will create a single window at customs."